Institute of Chartered Accountants of Nigeria, ICAN professional examinations timetable for the November 2014 Diet. 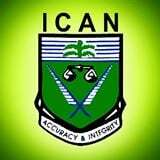 The Institute of Chartered Accountants of Nigeria (ICAN) professional examinations has been scheduled to commence from Tuesday 18 November to Thursday 20 November 2014. Examination Centres – There are 36 centres all over Nigeria and one each in Cameroon and London. Check the centre nearest to you from: ICAN Exam Centres. 2.00 p.m. — 5.00 p.m.